Q: How does one seal a filled earthbag? A: The answer to this question is actually not so simple, since various methods have been used, under various circumstances. The most frequent method that I have used is to simply leave enough exposed bag at the top to allow that extra material to be folded over when the bag is laid horizontally. The weight of the material in the bag will provide the seal, even with very fine sand. I usually laid this folded end of the bag against the previously laid bag, so that the loose end has the additional support of the other bag to lean against. Occasionally, I will need the full length of the bag for some reason, such as when I am creating an arch with two bags side by side covered by two more bags lying at right angles to the first ones. In this instance the top of the bag will need to be sewn or stapled closed, so as not to spill its contents. Sewing a double-folded hem with heavy nylon thread is the strongest method, but this is sometimes overkill if there is not much inherent pressure on the hem. I have lately been simply stapling the folded hem with common office staples, especially if the entire assemblage will subsequently be covered with a plaster that will protect the seam. Q: The tube, if cut, does fray quickly - can that be prevented? A: The poly material will fray after cut, but usually this is no problem because the cut end is tucked under the bag and gets compacted along with everything else and will no longer fray. If you want to avoid the fraying, you could cut the material with a heated knife and it would sear the material and keep it from fraying so much. Q: How do you close a bag after being filled? A: There are many ways to close the bags, the most simple being to just leave about 8" of loose bag material at the top and fold it over and under the bag as it is laid down against the previously laid bag. 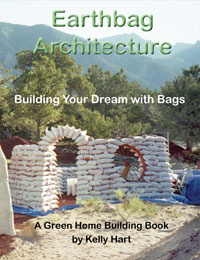 I used this method almost exclusively when I built my earthbag house. With this method you lose some of the potential length of the bag, so in a way it is a waste of material and also the shorter bags don't key into each other with the running bond (like bricks) as well. If you want longer, fuller bags you can hem and stitch the end using needle and thread or stiff wire. Owen Geiger demonstrates how he closes bags with two pieces of wire, bringing both corners toward the center in his video at Youtube. I have also closed hemmed bags with a stapler, and this generally works fine if not too much pressure is put on the seam. In any case, it is always best to place the closed end against other bags, so for instance bags at window or door openings always face away from the opening with the bottom of the bag visible.